Prior Scientific proudly introduces our latest and most innovative motorized stage for upright microscopes, the H101F flat top stage. 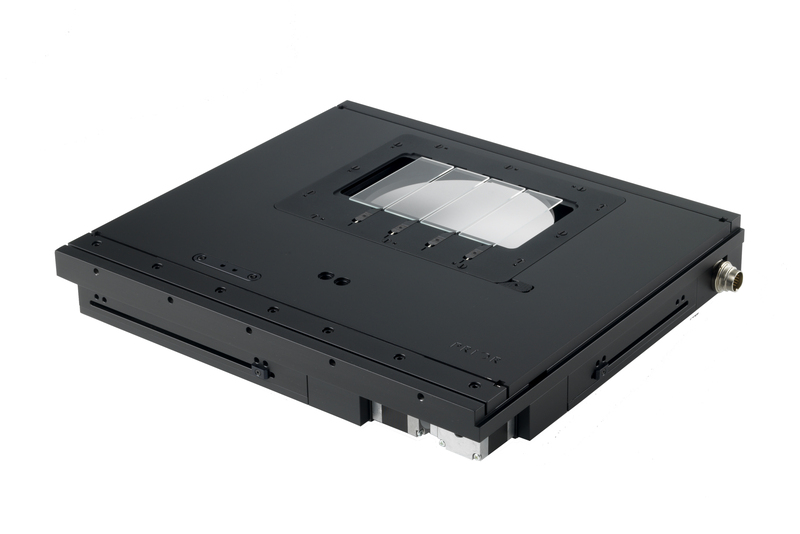 Significant benefits of the new ProScan H101F include a completely flat top plate design that provides unlimited obstruction free space for objective and nose piece rotation. Ultra lowprofile sample holders facilitate the use of high NA objectives/condensers while the latest in miniature high torque motors facilitate access to the condenser and other microscope adjustments. The larger sample holder design area accommodates a variety of applications such as large tissue sections and other custom sample holders. Optional embedded high resolution XY encoders provide the highest precision available. The H101F features smaller gauge stage cables which simplify cable routing. Older sample holders are also compatible with the new H101F by adding a simple adapter plate. The H101F ProScan® stage incorporates the patented – Intelligent Scanning Technology (IST). In conjunction with extensive testing, Intelligent Scanning Technology (IST) allows each stage to be pre-programmed with a unique set of operating characteristics particular to that stage to ensure optimum performance. IST (also available on H101A, H107 and H117 models) allows the ProScan®III controller to make any required adjustments to maintain superior orthogonally and metric accuracy. Requires the use of a Prior ProScan® II or above controller and are based on Prior method of testing. *Using a Prior ProScan® controllers with backlash correction enabled, all repeatability is uni-directional. Wide range of sample holders.